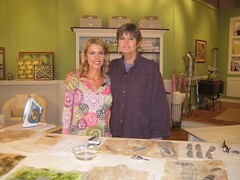 Here I am, on set, with Pokey Bolton of Quilting Arts magazine, QA TV and Cloth Paper Scissors. I filmed two segments for QA TV in Cleveland last week. It was way cool and I'm so thrilled and proud to be asked! 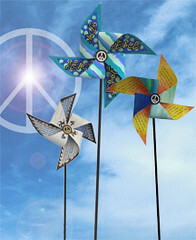 The show, part of the third season of the PBS program, will begin airing December 26. But fear not! you can purchase the season series on DVD from QA TV--series one and two now and of course, series three (with me in it) available in December. It was a really great experience, filming with Pokey and the folks at Kathi Stull Productions. I also met some artists, who were filming there segments. Shelly from Cedar Canyon Textiles and Laura from Laura Murrary Designs and Melissa, who designs for Westminster Fabrics and Melanie Testa who though I'd never met in person, we knew we were fast friends! And a highlight of the trip was having dinner with Pokey Bolton and getting to know her better. What an amazing and generous and smart woman she is! I'm back from Cleveland. 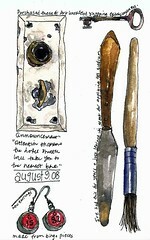 A quick note to tell you I'll also be teaching "Mixed Media with Paper and Cloth" online at joggles.com. 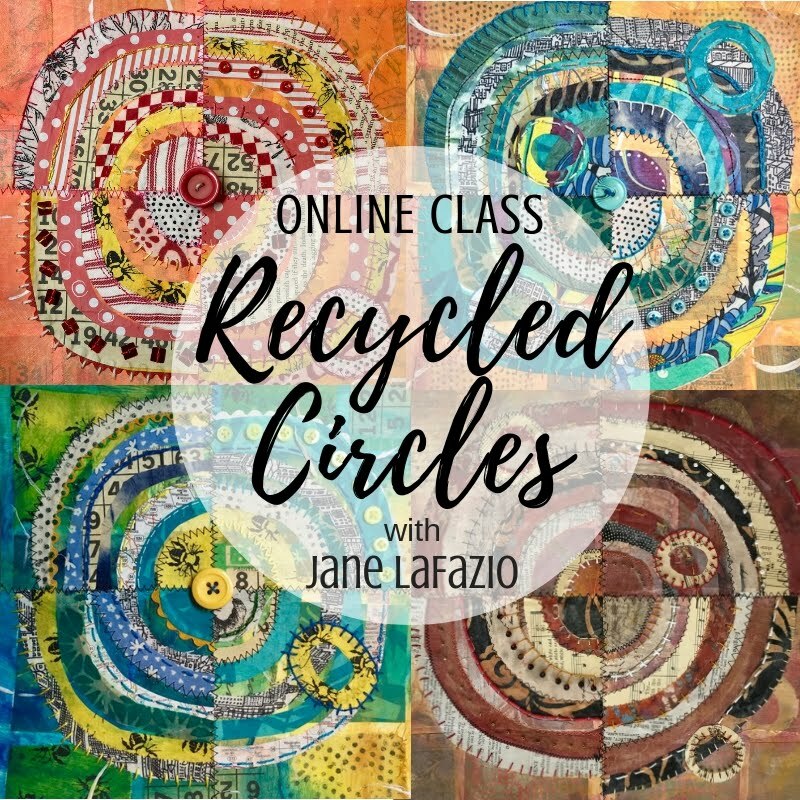 If you've never taken an online class, do try it! 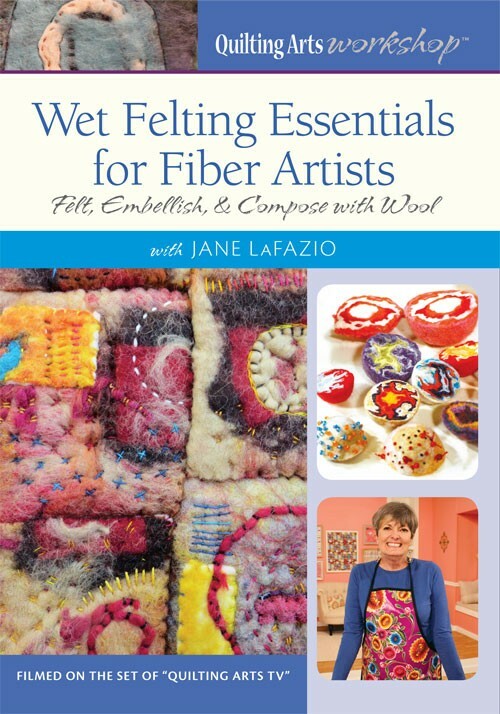 The class starts October 30, runs for 6 weeks and costs $75. Lesson learned. 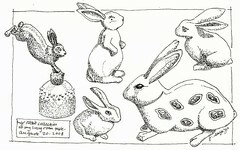 I drew these bunnies in the evening, and painted them in the morning. Duh, shadows weren't the same. Next time, I'll do it all at once. Off to Cleveland tomorrow, returning in a week. I get to meet Melly and see Pokey again, not to mention film the two segments on Quilting Arts TV. I'm going to add watercolor, but I wanted to preserve the ink-only version. stay tuned. this is actually pretty tiny. 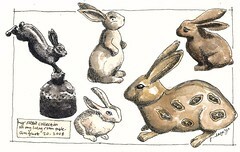 It's the start of a Moleskine page of my collection of metal bunnies. 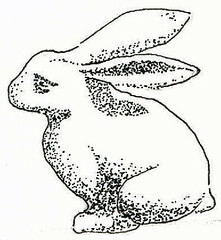 Stippling takes a lot of patience! Found this owl feather on my walk with P yesterday. Blue Acorns and the Quail. 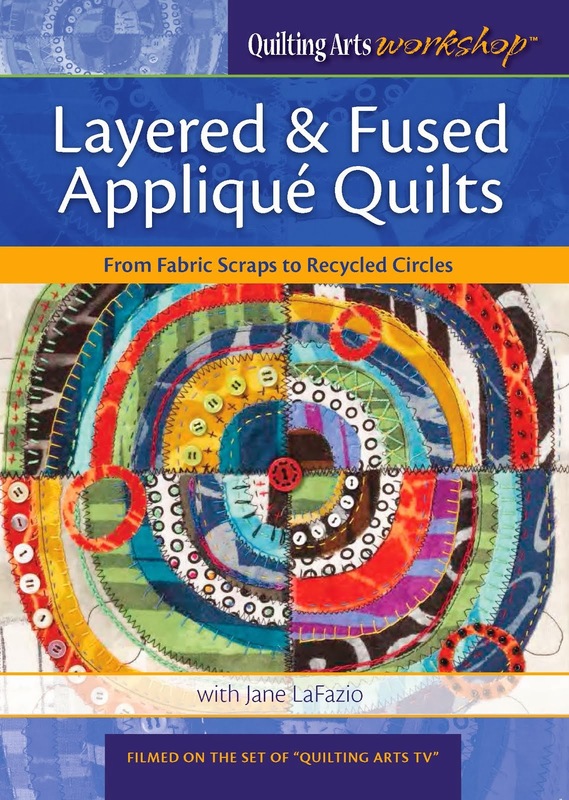 I'm going to Cleveland next week to film for Quilting Arts TV. I'm doing two segments for the TV show, and of course, I'm thrilled, but as the date gets closer, I'm getting nervous. I'll be doing a paper on cloth segment-10 minutes long!-and here's one the finished pieces. Now that I look at it, I think I need to fatten up the quail legs. (yes, Davi! I'll give you first choice on all my quail pieces :-) And I'm also doing a 5 minute segment on organza. Working on both, right up to the last minute! The Complete Works of Wllm Shkspr (Abridged) was written by the Reduced Shakespeare Company, and first performed at the Edinburgh Fringe Festival in 1987. Within the span of the evening every single Shakespeare play is covered as well as a nod given to the sonnets. It is notable for holding the (self-proclaimed) world record for the shortest-ever performance of HAMLET, clocking in at 43 seconds. 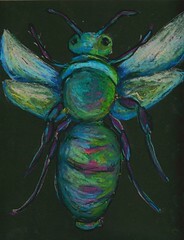 It was bug week at Mundo Lindo We drew them in chalk, from pictures, and used oil pastel. This is one of mine. What’s mixed media? Everything and anything! 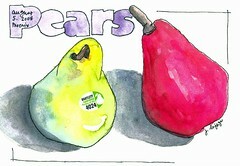 You’ll paint, collage, draw, print with our own hand carved stamps, sew, glue, even burn---all to make art. 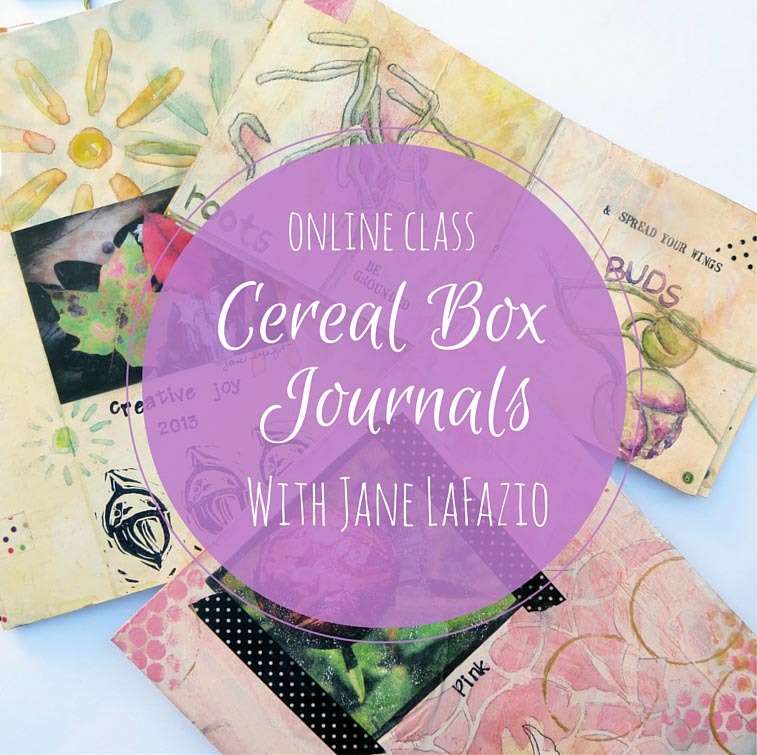 This class encourages your own creativity with lots of techniques and ideas. Most everything in the class can be done on a paper surface OR a cloth surface or combining the two. 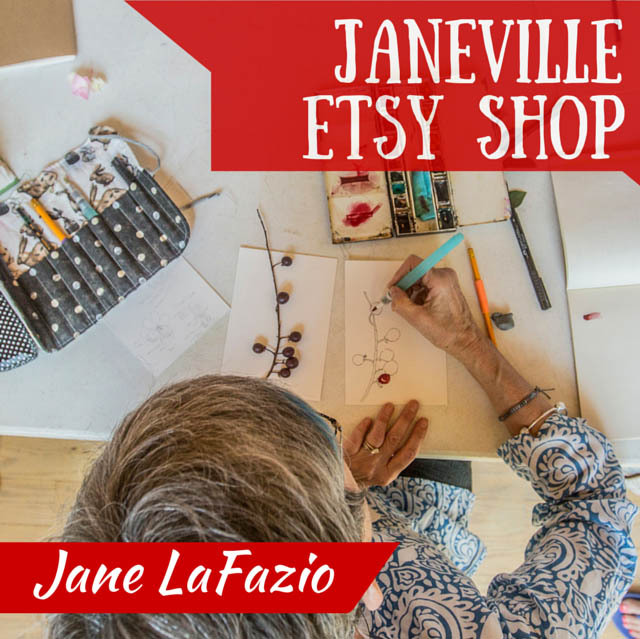 Each week you’ll explore a new technique or theme. Class will be inspirational, positive and fun, with lots of sharing, laughing, and learning from the others in the class. All levels of experience welcome, and previous students can expect all new lessons. Materials: $20 materials fee will be collected in class. 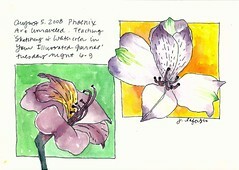 For the first day, please bring pencils and 140 watercolor paper any size. A materials list will be given and discussed at the first class. 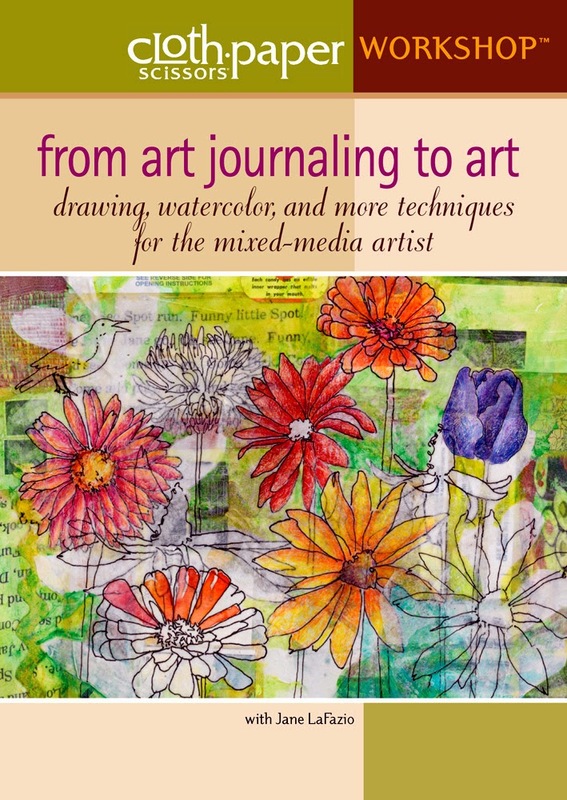 I created some samples to show my students in the Art Unraveled class I taught--sketching and painting watercolor in your journal. first day in phoenix. Husb and I walked at 6am. 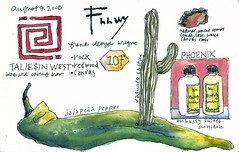 We visited Frank Lloyd Wright's Taliesin West while in Phoenix--it was fascinating. sketching during the art unraveled shopping extravaganza. 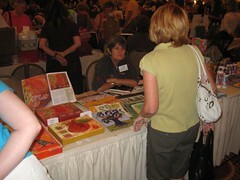 Me at my table of goodies at the Art Unraveled Shopping Extravaganza. I was tired, but not as tired as I look in this photo! I taught 2 classes this year. My first time at Art Unraveled in Phoenix. 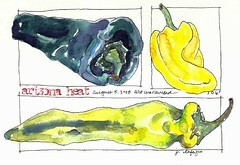 The art retreat was great--nice people, well organized event, lovely hotel, and good teachers. (I attended two workshops while I was there.) 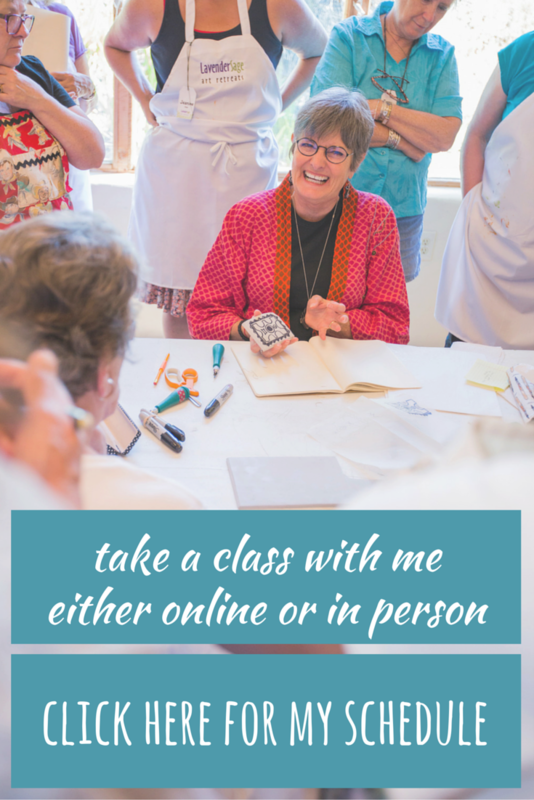 Next year I hope to teach 3 classes...I'll keep you posted! 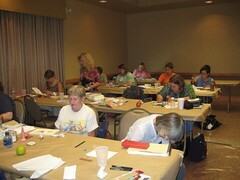 Here's a pic of my 'sketching & watercolor in your journal' class, held in the evening from 6-9pm. Full with 20 people. 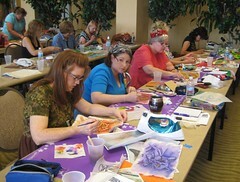 Here's part of my class from"Two Art Quilts Two' at Art Unraveled. That's Angie and Fran in the front row. 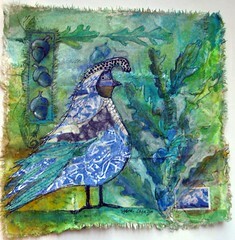 Off to Art Unraveled today! 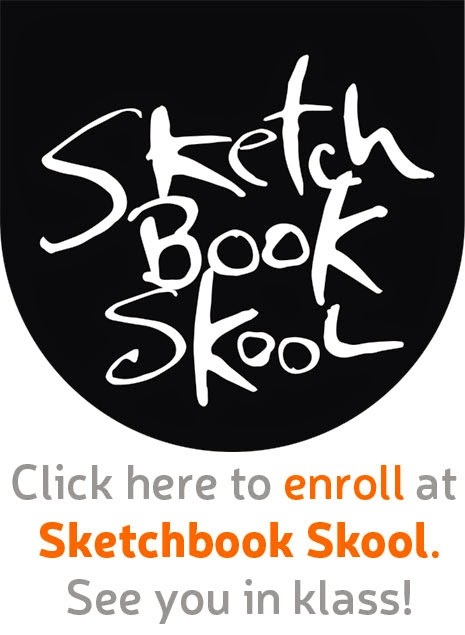 Teaching and taking workshops. Stay cool. I'll return in a week or so.